4.3 x 2.6 x 1.9 in. The Canon PowerShot A640 couples a 10 megapixel CCD imager sensor with a 4x optical zoom lens that offers a 35mm-equivalent focal range of 35 to 140mm. That's a moderate wide-angle that reaches to a somewhat more generous telephoto than you'll find on most compact cameras. Maximum apertures vary from f/2.8 to f/4.1 across the zoom range. The A640's sensor yields an ISO range of 80 to 800, with shutter speeds of 1/2,500 to 15 seconds. Designed with ease of use in mind, the Canon A640 offers both a range of features that make it approachable to beginners, as well as the ability to exert more control over the photographic process. For the former category of users, there's a fully automatic mode, and a generous selection of 13 Scene modes. For the latter, you'll find Manual, and Aperture/Shutter Priority exposures possible, plus preset, or manual White Balance, and three Metering modes. A VGA-or-below Movie mode captures videos at a maximum of 30 frames per second, for up to one hour (or one gigabyte) per clip. A USB connection allows easy offload of images from the SD, or MMC card to a Mac, or PC -- and unlike some manufacturers who are still clinging to the older USB 1.1/2.0 Full Speed standard, Canon has adopted a much swifter USB 2.0 High Speed interface in the Canon A640. For users without a computer (or those who like to make quick prints without the hassle of touching their PC), you can bypass the extra step completely, and print directly from the PowerShot A640 to a Canon, or other PictBridge-enabled printer via the same USB connection. Though the Canon A640 has a relatively large 2.5 inch LCD, Canon retained a real image optical viewfinder in the A640's design. Not only can optical viewfinders save battery life if you turn off the LCD display, but they're also useful when ambient light makes it tough to see many LCDs properly. Power comes from four AA batteries, and Canon includes single-use alkaline disposables in the product bundle. Also included with the Canon A640 is a 32MB MultiMediaCard -- perhaps slightly larger than average, but still not sufficient for more than a handful of photos at the highest resolution and lowest compression. If you don't already have some, you'll want to purchase some rechargeable batteries and a larger flash card along with the camera. The Canon lineup is so rich with options it's often hard to tell one model from another. If you want a camera powered by AA batteries, Canon's A-Series is the one for you. The A-Series digicams all use batteries you can find anywhere, and give you a decent grip, too. Yes, they're a bit bigger than the Digital ELPHs, but their heft makes them more stable for handheld shots, and they have more exposure options. Front. The lens is fully extended. I call that a black body, but you may discern a very dark gray. But even within the A-Series, you have options. The Canon A640 might, for example, be easily confused with the A630, except it has a 10 megapixel sensor, a black body, support for remote capture, and costs $100 more. But it shares the same lens, controls and body design, including a variable LCD you can swivel for a more comfortable view of your subject. Back. The control layout is simple (not too many buttons) and easily managed with just your thumb. 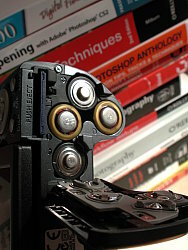 Luke was particularly happy to see that the Mode switch toggles between Playback and Record only, with Video moved to the Mode dial. In this shot, I flipped the LCD around so it looks like any other digicam. Design. A large 2.5-inch LCD is always welcome, but the Canon A640's is what Canon calls a Variable LCD (an articulated one, that is, that swings out and rotates up or down so you can compose a shot with the camera over your head or below your belt). 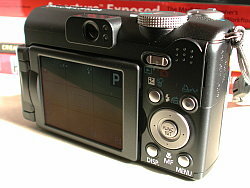 Canon has also included an optical viewfinder, which despite its approximate rendering of the scene is indispensable when the glare of the sun makes it impossible to see what's on the Canon A640's LCD. Although here again, having an LCD you can move independently of the lens means you can often eliminate that glare. Battery/Card Compartment. The hinge is right next to the plastic tripod mount, but it's very easy to access either the card or batteries. As with other A-Series Canons, the A640 has a grip you can get your hands on thanks to the four AA batteries it uses for power. Although it's substantial, the grip isn't too fat to keep the A640 out of your pocket, although I tended to prefer to simply swing it from my wrist so it was ready for action. The Canon A640 doesn't cheat on exposure options either. There's green Auto for those times when you have other things on your mind. And Program when you want to have at least EV control over exposure. But there are also Shutter and Aperture Priority modes. And -- drum roll -- a full Manual mode as well. Add a Custom mode to save a special configuration and there's really little you can't do with this digicam. 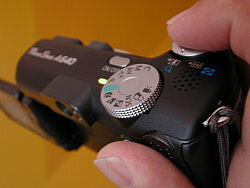 On the other end of the Canon A640's Mode dial, you have Movie, Panorama and Special Scene modes. There're also the primary Scene modes Portrait, Landscape, and Night Scene. Top. An unobstructed view of the top panel, showing all the controls on the right, where the wrist strap attaches. The controls and menu system have, by now, evolved into a package that's really comfortable to use once you learn how to play the game. In Auto, you don't worry about the buttons at all. In Program, just hit the EV button and change the exposure with the Left or Right arrow keys. Shutter and Aperture Priority modes use those arrow keys to adjust their values, too. 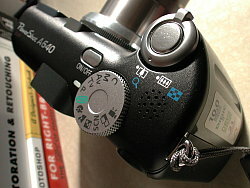 The Canon A640's Manual mode uses the EV button to toggle between aperture and shutter speed, both adjusted with those same arrow keys. 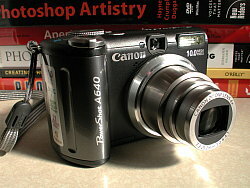 In short, the Canon A640 is a well-designed machine. Grip. My actual shooting grip with the LCD articulated so it can be swiveled up or down. Very comfortable with the Mode dial easy to check. Display/Viewfinder. 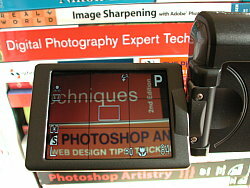 The Canon A640's 2.5-inch LCD is large by any standard, but it only displays 115,000 pixels. The big news, however, is that you can swing the LCD out from the back of the camera and twist it up or down, or even face it forward for self-portraits. You can even flip it back so it pops right back into the rear panel as if it were an ordinary LCD. And if you tend to scratch things, you'll be happy to know you can close this LCD with its back facing outward to protect it. Once you've used an articulated LCD, you'll never want to be without one. LCD. I'm holding the camera well below eye level to focus on the book spines, but I can easily see them because the LCD swivels. Often you just want to shoot from a lower or higher angle than eye level. After all, everyone knows what things look like from eye level. But drop the Canon A640 down to floor level, angling the LCD up so you don't have to lie flat on the floor, and you'll get some marvelous shots of children at play in the low-rise world they inhabit. And when you're straining your neck to look over the crowd in front of you, just raise your arm with the LCD angled down to get an unobstructed shot from above. One of my favorite photo tricks is to shoot at angles other than eye level. An articulated LCD makes this easy to remember and fun to do. Luke, who shot the lab test shots with the Canon A640, didn't like the optical viewfinder. But kudos to Canon for including one. The sun can be just too bright to see the LCD when you've got the camera pointed in the right direction. Even an inaccurate optical viewfinder will give you some idea where your subject is floating in the frame. Performance. I'm sensitive to slow startups and reluctant shutdowns. They actually change my behavior. If they're really slow, I leave the camera behind. If they're annoyingly slow, I leave the power on and hope the thing wakes up from sleep fast. But I prefer to manage my battery life by shutting down when I won't be taking a shot for a while and turning the camera on just before I want to shoot. The Canon A640 is, I'm happy to say, responsive enough that I can do that. I never seemed to miss a shot waiting for it to start up and I certainly never hesitated to shut it down for fear starting it up again would take too long. Shutter lag is increasingly a thing of the past, and the Canon A640 is responsive here, too. I didn't happen to shoot any action shots with it, but from the time I decided to press the Shutter button and the actual trip of the shutter were not far from simultaneous. And, as Luke observed, the cycle times are really pretty good. The Canon A640 clears the buffer after every shot in every mode. Shooting. I took the Canon A640 on a bike ride up Twin Peaks with the A630 to shoot my usual cityscapes. It was an usually clear Fall day, so the A640 took some fabulous shots, among the best I've gotten there. If you want to know the difference in resolution between the 10 megapixel A640 and 8 megapixel A630, just study these shots. 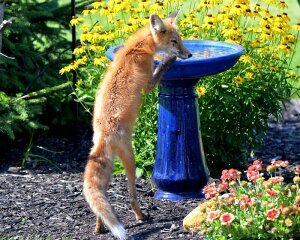 One of the things I like to try up there is digital zoom. Canon's digital zoom isn't bad at all, a far cry from the old resamplings that led Dave to warn against ever using the thing. It may not be quite as satisfying as a few other companies manage (you can tell a digital zoom shot from a telephoto one), but don't feel like you have to avoid it. Maybe it was the clarity of the air, but my shots of very distant objects came out much better than I'm used to. The Bay Bridge and the Golden Gate Bridge are usually disappointing. They're flat here (nothing Auto Levels can't fix in a mouse click) but they fill the frame with detail. Zoom. Four times optical, plus 4x digital. You see this particularly in the three-shot sequence that starts at wide angle and includes the rock wall right in front of me. There just happens to be an accommodating post right there that lets me steady the camera without hauling a tripod up the hill. From that same position, the next shot shows the full telephoto crop. And the last in the sequence shows full digital zoom. That's really quite a range at 16x (4x optical with 4x digital) and, as the bridge shots show (see the gallery), on a sunny day you don't need image stabilization to enjoy it. I took the Canon A640 to a friend's home for a party and got some interesting shots. Unfortunately, none of my friends would sign model releases, so I can only show you the shot with everyone facing away from the camera <g>. But I took it two ways and you can learn something from each of them. Two Approaches. The powerful flash lit up this room, while the 1/10 sec. natural light shot wasn't too blurry. The first shot of the kids interacting with the TV's videocam was taken with the Canon A640's flash. And it pretty nicely lights up the room -- from the next room. Not many digicams have that kind of range. The far wall is evenly lit and the pictures on the mantel are all clear. But I'm not a fan of flash (the Canon A640 took about five seconds to recharge; too long for real life, if not very long for such a powerful flash). So I shot the scene again using natural light. The first surprise was that the shot was well exposed under the ceiling cans. The custom white balance I used yielded a very warm scene, not the rendering Canon's auto white balance would have delivered. But the ISO 100 setting at 1/10 sec. was surprisingly usuable. Sure, there's some blur from both the kids' movement and a little camera shake. But considering there's no image stablization, it's remarkable what the Canon A640 was able to do. Shooting wide angle, no doubt made the difference. Two Tough Shots. EV compensation was required for the top one, but Auto did fine for the bottom. I noticed a crystal door knob in the sunlight, where it had acquired a purple cast from exposure to the sun over some 50 years, unlike its mate on the inside of the door. I used the Canon A640's Program mode so I could adjust the EV to capture the purple of the sunlit knob, and that worked very well, dipping down as much as two stops to get what I wanted. I missed having a live histogram for a shot like that, but the histogram available during playback was good enough to tell me where I was. After all, that knob wasn't going anywhere; not after 50 years. But a more standard shot, like the back of a Photoflex Starflash strobe we're testing, showed another impressive aspect of the Canon A640. It's a pretty high-contrast shot taken at wide angle with a shutter speed of 1/103 sec. (so you know it was Auto mode). But there's detail in the shadows and the highlights aren't blown out. The dynamic range this camera captures is excellent. In fact, we weren't disappointed at all by our Canon A640 shots. The color was natural, the dynamic range didn't lose detail, and the camera seemed to get shots in situations that were not very promising. Large capacity SD/MMC memory card. These days, 512MB to 1GB is a good tradeoff between cost and capacity. Canon PowerShots have always been big favorites of our readers, valued for their user-friendly design, excellent photo characteristics, and good build quality. The Canon PowerShot A640 follows suit, sporting an impressive 10 megapixel CCD and a very good quality 4x optical zoom lens. The Canon A640 offers everything from full automatic to full manual exposure control, with a healthy set of Scene modes thrown in to make it easy to bring back great-looking photos from what might otherwise be challenging situations. The Canon A640's articulating LCD is now bigger and still just as useful as past iterations, and its reliance on AA batteries is a critical factor for many who want to have a ready supply of compatible batteries no matter where they travel. Thanks to the Canon A640's high-speed DIGIC-II processing chip, it is also very responsive, and its movie capability is impressive as well. Its the Canon A640's image quality that makes the sale, however, with its lens delivering superb sharpness across the frame. The A640 is arguably the first 10 megapixel digicam to meet the potential that the impressive size implies; and high ISO shots are also very good across the range of options. Bottom line, the Canon A640 is destined to become a classic. The Canon A640 is just an excellent all-around digital camera, an easy choice as a Dave's Pick, and we'll go further and give it our heartiest recommendation as a great all-around performer for almost anyone.